It wasn't long ago I was talking about Mat Recardo's ZX Spectrum game ' Robot 1 in The Ship of Doom ', which put you in the rollers of a character called Robot 1, who was been left behind by the crew on a space ship that was on a collision course with the sun. It was a very nice game with music by Sergey Tosov and developed using AGD that also featured as a tape by Psytronik Software! 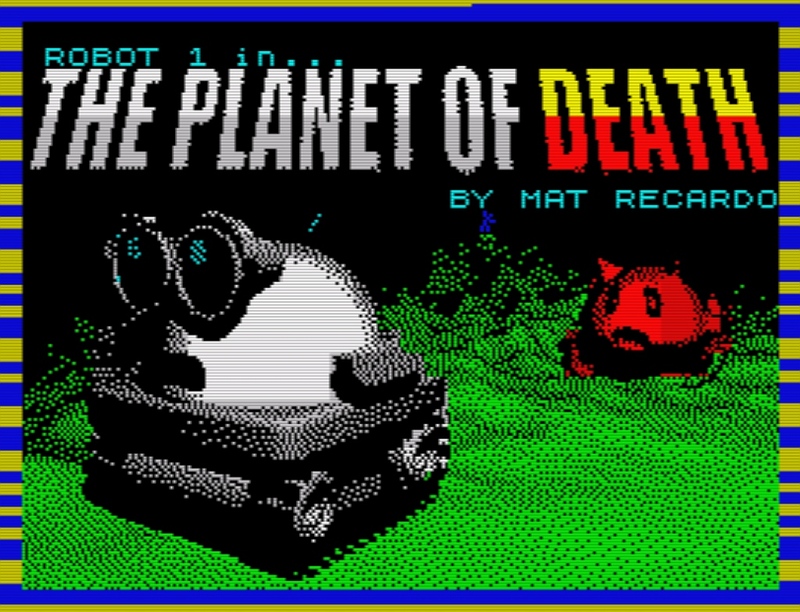 Well as it's a Monday we are pleased to announce the ZX Spectrum sequel of Robot 1 in.... THE PLANET OF DEATH!! Yes thanks to a heads up by pb48k via our twitter feed, we have found out that a sequel has been released by not just the same developer, but also features the same high standard of gameplay with music by Sergey Tosov. Not only that you'll be pleased to know you again play as Robot 1, but this time it looks as if he has made good is escape but instead has been teleported onto an alien world and needs to try and send a rescue message, with the aim to also gather supplies and interact with the local biologicals. So if this sounds like your sort of game head on over to the main website below and check it out, you'll be glad you did.